This class builds on Obedience skills you learned in “Real-Life” Manners. The course is for owners who really want to focus on Obedience details to achieve greater precision and accuracy. It’s about what you “want” your dog to do, rather than what you “don’t want” your dog to do. This is a great relationship building class for you and your dog. 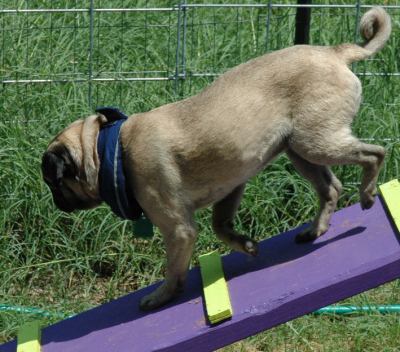 We use Positive Reinforcement with games and obstacles to teach behaviors. The class is lively, fast paced and fun! You’ll learn to set your dog up for successful precision finishes, straight fronts, reinforcement placement, and work toward off-leash heeling, hand signals, platforms, and more, including the 3’D’s- Distractions, Distance and Duration. We do a lot of proofing to insure your dog will learn to listen to commands and respond, despite distractions. Positive Reinforcement – Reward Base training is used with food, toys, praise, and play to build trust, respect, and stimulate your dog’s mind and body. You’ll learn about our fun “Temptation Lane” as well as everything you’ll need for your training tool box to ready yourself for competition skills or just have a fun time learning new skills with your dog. 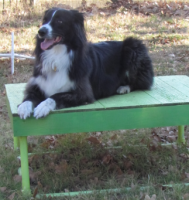 fun, and a healthy learning environment so you and your dog can succeed. "Uping the Bar" this year with 1.5 hours! You will learn and why you learn it. The Barking Lot, simply blows away other training classes.